Fact: when I was a teen, I was utterly obsessed with Daria. Every afternoon I would stretch my acne-riddled body across the living room sofa to watch the antics of the outcast of Lonsdale High. I was convinced that there could be no cooler person on the planet than Daria, and I held her up as my own personal role model. I could relate to her frustration with the monotony of high school life, her fascination with the macabre and her ongoing rivalry with her more-popular sibling. In my eyes, Daria was the Queen of the Misfits. Now, fifteen years later, I’m still smitten with the abrasive Miss Morgandorfer and her quick-witted buddy, Jane Lane. So when I found this tee shirt in Pulp Kitchen, I couldn’t resist snapping it up. Although they are on the pricey side, Pulp Kitchen’s tees are worth the extra bucks. Not only are they really soft and comfortable, but the prints stay vibrant for ages and they keep their shape really well. 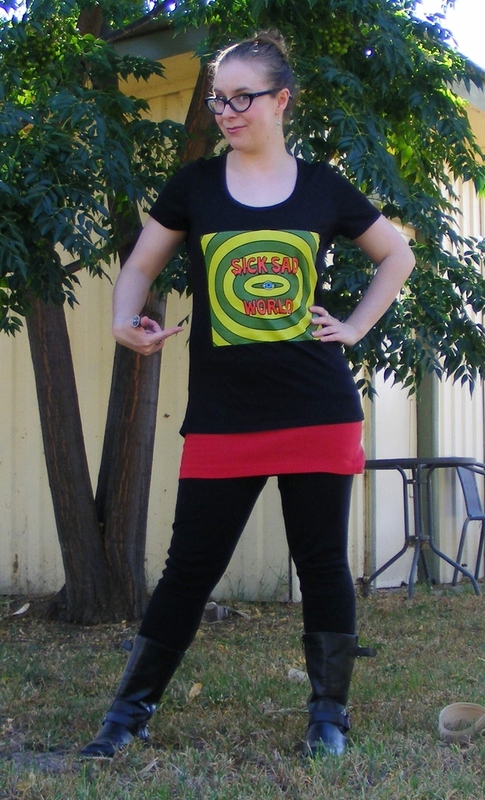 Plus they have such a brilliant range of prints that range from geeky to nostalgic. Were you a fan of Daria back in the day? 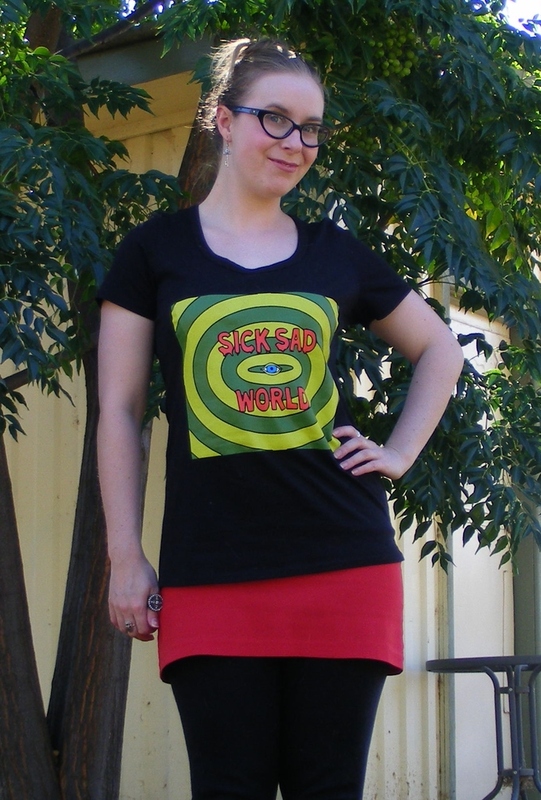 That Sick, Sad World shirt is amazing. Is it that screenprint stuff, though? My hubs ordered a tee from that site and it was the painty-screenprint-stuff that cracks after a wash or two. 😦 And at those prices! I am also a Daria addict and own every season and re-watch them all the time. I had no idea it existed when I was a teenager. I did know that it was very bizarre that every time I’d walk down the halls at school, people would go ‘lalalalala’ and I’d gotten a weird nickname. Then, I finally saw the show one day and I knew why – it was me. I had the outfit, the glasses, the hair, the attitude. Been addicted ever since!! 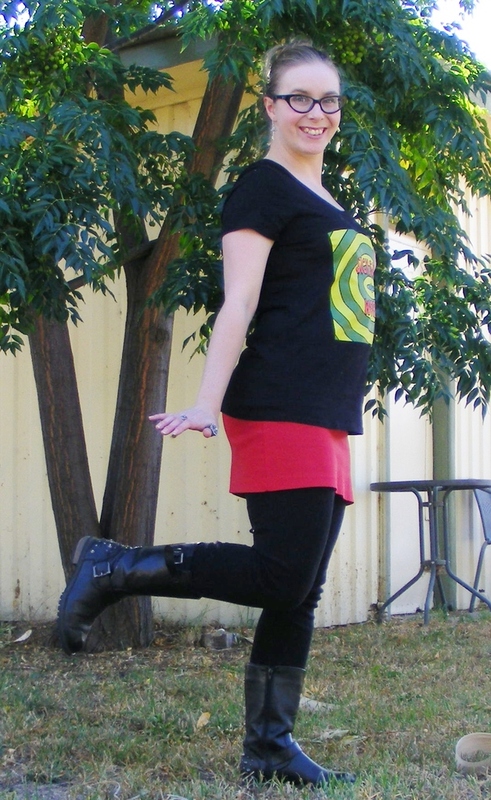 Yeah, this particular shirt is screen print, and it was fairly expensive. However I’ve found that the screen print shirts from Pulp Kitchen hold up pretty well. I’ve got a couple and none of them have cracked even after many washes and wears. I also have many of their silk-printed shirts which are brilliant quality. My Empire Records one is nearly seven years old and still going strong! Yes! I LOVED Daria, still do. I have the DVD collection so I can watch whenever I feel like it! Love this outfit! Thank you! I have the box set and i still enjoy the odd visit to Lawndale High from time to time. I think you would really enjoy Daria. It’s hilarious and very tongue-in-cheek. If you can get your hands on a copy I really recommend checking it out.